This November (2018), I wrote a poem a day for Tupelo Press’ 30/30 Project. They are a small, independent press seeking to publish and promote new poets. At the project’s completion, I was asked to read a selection of my work in the new Miller Hall. I was especially delighted to work with American Sign Language interpreters who translated my poems for several guests. 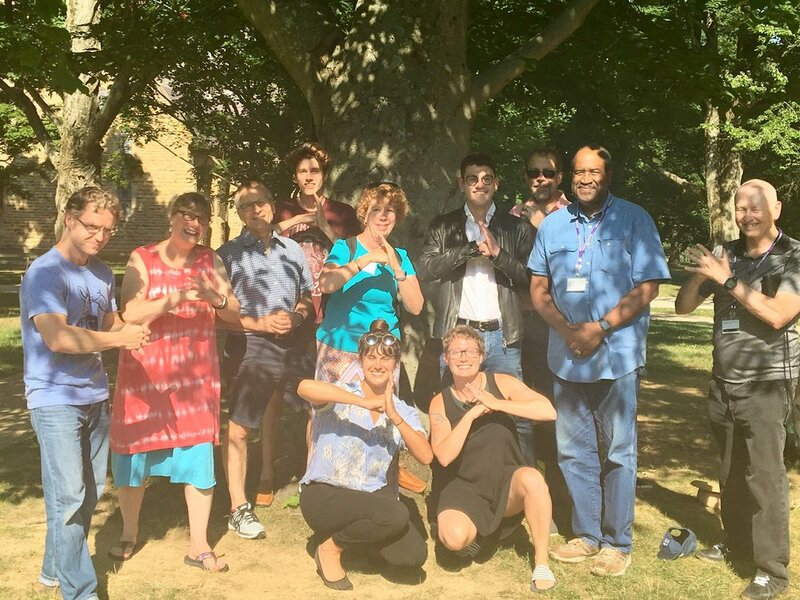 This summer I attended a Kenyon Review workshop on spiritual writing led by the distinguished American poet, Afaa Weaver. I am honored to call him my teacher and stand beside him in this photo, surrounded by the rest of the “Spirit Boxers” composed of poets, priests, teachers, and an architect. — If you’ve never read Afaa Weaver’s work, make purchasing his poetry a top priority. What a stimulating conversation on art, nature, god, and technology celebrating the launch of the catalogue for Sarah's show, now touring the world. The catalogue features my essay, "Ascending to the Cloud: Art after Humanity and Meyohas' Cloud of Petals." Thanks to Red Bull Arts for hosting the panel with Sarah and me, and specials thanks to Sarah for such a great show, and to Trevor Paglen, artist and MacArthur Fellow, for asking such great questions. Photographs by Jeff Thibodeau. I'm currently working on a series of articles on technology. One of them theorizes the nature of computers as part of the history of literacy - the greatest technological revolution in human memory. As a result, I've had the delightful excuse to read a bunch of things sitting on my wish lists (I use Amazon wish lists as bibliographies, true nerd style). I got Computer: A History of the Information Machine, 3rd edition, for Christmas, and I'm four chapters in. A fascinating and important point made by the authors is that the history of the computer is not what it was thought to be in the 1970s, when the history of computers started to be written. At the time, computers were construed primarily as literal computation tools, but the authors point out this is misleading, so the term "computer" is, they say, a misleading name for the contemporary technology we call computers, which do primarily clerical rather than purely computational work. This is a compelling observation that points to the much broader framework we need to have to interpret computers and a society based on them. The authors stress the role of computers as information technologies used for business and data storage, so their first three chapters deal with what is more broadly information and business history, specifically the rise of large-scale information systems, like the census and modern financial institutions. Their description of a computer, which opens the book, is a useful stopgap, but the truth is I don't think we have a good description yet of modern computers, especially because the computer post-software is a very different thing than the computer pre-software. Whatever computers are, they cannot be defined by the technical apparatus that underlies them, just as you can't define a house by the fact that it has walls and encloses space - lots of building do that. Sharing underlying material forms does not offer a means of distinguishing an artifact; only functional differentiation, a mode of analysis pioneered by Plato and used to great influence in Aristotle, can help us define what a thing is. Computers currently do so many kinds of things, and in so many different sectors of society, that an attempt to theorize their distinctive function is fraught with challenges. One of the most significant is that the background space, what you could think of as the room in which the definition, viewed as a piece of furniture, would sit - that space is itself not clearly understood. A major part of my current work is to explore that space as a means to better understand all the furniture - computers, the internet, AI - that gives it the shape it has in our lives. Expect more thinking about technology, computing, the internet, and AI in the New Year. You can have access to more notes like this on my Patreon. I have a new piece at a great sociology blog, orgtheory.wordpress.com, about grad student publication and the need to be self-conscious about the larger institutional dynamics that shape individual academic disciplines. Besides my scholarly articles and book, I'm currently working on a some essays and articles for a wider audience, which will come out in the next few months. One is on the Science vs. Religion controversy, which is a myth, as the history of science shows. I'll explore that by discussing Jerry Coyne's Faith vs. Fact: Why Science and Religion are Incompatible and a major recent work in the history of science, by a leading scholar on science and religion. Art interprets culture back to itself. It can critique, explore, affirm, or disturb our cozy sense of clarity about what the world means and who we are. Art and philosophy are siblings, twins who can be hard to distinguish. Good philosophy can be a work of art; a life well lived, an artistic endeavor; and art itself an essay towards meaning. In my latest work, I look at the sacred in the everyday at Wet Eyes, a recent exhibition at Meyohas, an apartment gallery on the Upper East Side: "Finding meaning on the Upper East Side: Wet Eyes." If you don’t believe me, I understand. Philosophy today evokes images of bearded thinkers writing abstruse treatises. These thinkers are a class, a guild, part of the education system, boasting advanced degrees and academic expertise. It wasn’t always that way. In fact, the idea that philosophers are professors is a new idea. The New York Times published an excellent essay, “When Philosophy Lost Its Way,” on how this system originated. Our university system is an extraordinary gift to humanity, and I am glad it has a place for professional philosophy. I wouldn’t be who I am as a person or professional without academic philosophy. The problem is when academic philosophy, which I practice and support, forgets that it is both new and narrow. It has to answer to systems and pressures that have nothing to do with wisdom; that’s fine, it’s a job, like any other. But philosophy was never about a job. Philosophy was – and in its truest form remains – a way of life, open to all. That’s one reason I practice academic philosophy as a scholar of religion; not only are these compatible identities, even as a professional, but they are closer to philosophy’s historical origins than the divorce between “philosophy” and “religion” that seems so common today. But the reason I practice academic philosophy is because I am a philosopher; I was before I went to school, and I would be even if I left academia. That’s why you can be a philosopher without being an academic; you can be a philosopher without having a degree; you can be philosopher no matter who you are. Because you love. Philosophy does not just start with love. It continues and ends with love. Philosophy is love all the way down. And love is for everyone. Love moves us. It moves toddlers across the floor into their parents’ arms. It moves people to make a life together. It moves enemies to make peace. Love joins. And love creates. When love moves us to question, to seek, to find out who we are and how we should live, it moves us towards wisdom. We all want to know what is true about the world and ourselves. No one wakes up wishing to live a lie. The love of wisdom – philosophy – moves us out of self-satisfaction, kicks us out the door of numb ignorance, and sends us stumbling towards the best version of ourselves. Everyone has this love because we all want wisdom, even if we don’t know what it is. Wisdom is to truth what happiness is to pleasure: more, not less than, the deepest longing of our hearts. Happiness is pleasure in harmony with our ourselves and the world, pleasure that comes from living our true selves. Truth is haunting fragment, a wandering melody. Wisdom is the home truth left and searches for, the place where truth makes sense, not just to us, but of us, and the world. When you want the world to make sense but will live with uncertainty. When you want meaning but will live with frustration. When you want happiness but need truth. When you love but don’t know what, walk but don’t know where. You are living the way called human. We look to the university for knowledge. What do we do, then, with fields that don't seem to know? We intuitively understand that not all disciplines are the same. English isn't the same sort of thing as biology; the humanities, more broadly, are different than the sciences. Yet we assume that their location in a university means they provide a disciplined knowledge or insight, whether it concerns cells, particles, novels, or ideas. But what do philosophers know? And how do we justify the idea of disciplinary philosophy, that is, philosophy not as a way of life, but as a part of a university system? Moreover, what are the effects of the disciplinary structure of philosophy on its claims to provide knowledge? I argue we should be highly skeptical of disciplinary philosophy, yet that it also has the resources to respond to this skepticism, and that doing so teaches us about more than just philosophy. What would such an account of philosophy look like? This is task I take up in my most recent academic article, "Why Listen to Philosophers? A Constructive Critique of Disciplinary Philosophy." If you're interested, click here to read a pre-publication draft. The article will appear early next year in the journal Metaphilosophy.